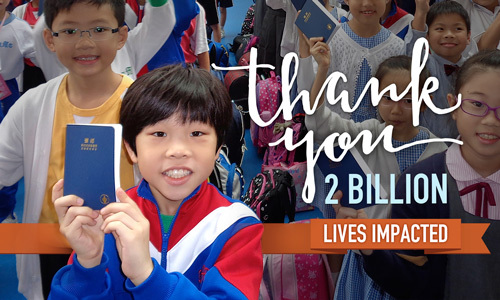 The Gideons International has just surpassed the two billion mark in distributing Bibles and New Testaments. The distribution of the first one billion Bibles and New Testaments by Gideon members spanned 93 years (1908 to 2001). This second billion was attained in less than 14 years (2002 to 2015). To celebrate what God has accomplished through this ministry, The Gideons are scheduling representatives of their membership to present a Two Billionth Commemorative Bible to as many of the leaders as possible in the countries in which they are organized. The Gideons currently distribute over 80 million Scriptures annually, and the numbers are growing, especially in places like Brazil, India, and Asia. Through the efforts of over 300,000 members in 200 countries, territories, and possessions, The Gideons share more than two Scriptures every second of every day—in over 90 languages. As we rejoice in this two-billionth Scripture placement, we are mindful that the real significance is what the number represents. The impact of these Scriptures can be seen through the many testimonies we’ve shared with you on this blog. These are real stories of souls saved and lives changed as a result of someone coming to a saving knowledge of Jesus through a copy of God’s Word provided through The Gideons International. And as the Lord is faithful to His promise in Isaiah 55:11, we can be assured that each Scripture placed touches a life, and often, many lives. We are also deeply grateful for the pastors, churches, and individual donors who support us through their prayers and gifts. Most of all, we thank God, to Whom we give all the glory for each and every Scripture distributed, and for every soul saved as a result. Until He comes again, we will continue to seek His will in taking His Word to all the nations. Please share this praise for our two billionth Scripture with your pastor, friends and family. Would you like to make an impact right now? Click here to Give God’s Word. Praise the Lord for all that you have committed to the ministry over the many years. So many lives have been changed because of your efforts. LED BY THE HOLY SPIRIT. GLORY HALLELUJAH!! PRAISE BE TO THE FATHER ,THE SON AND THE HOLY SPIRIT!! LORD JESUS WE EAGERLY AWAIT YOUR RETURN – UNTIL THEN WE WILL CONTINUE TO SERVE!!! FOR WE ARE LABORERS TOGETHER WITH GOD!! Heartiest congratulations to Gideons & Auxiliary for helping in achieving distribution and placement of God’s word pan the globe. Thank you to all the Pastors, friends and well wishers for the Gideons Ministry that God enable us to reach 200 billion souls across the Globe. Thanks to the leadership in the Ministry for their guidance and able leadership for being partner in the expansion of God’s Kingdom. All praise, honor and glory to God Almighty. Praise the Lord. We have been praying for this. We are also praying that the list of unfilled orders will go down soon. Thanks for the news. I have a question; are the Gideons allowed to place a Bible in motel rooms or in hospital rooms. Truly only eternity will tell the number of souls that came to the saving knowledge of Jesus Christ through the reading of the Gideons Bible placed and distributed for more than a century now. Thanks to Pastors and church congregations for the support. Keep on Gideons for the glory of God! Good News about the Good News! We Praise God and trust every scripture turns a heart to the Father. THAT IS GREAT AND GREATLY TO BE PRAISED!!!! Praise to our Father in Heaven, and to our Savior Jesus Christ. It is only known in Heaven how many souls are saved, we rejoice with the Angels. Let us continue in the Work until Christ returns. In the Service of Our Savior, Jesus Christ. I still have the one presented to me January 29, 1946. Praise the Lord ! As a Gideon living in India, I am blessed to be part of this great Ministry, God has placed me in. This moment of reaching the milestone of 2 billion of God’s Word distributed across 200 nation spurs me to strive harder to take the Gospel to the many in my country who do not know about Jesus. Praise the Lord ! As a Gideon living in India, I am blessed to be part of this great Ministry, God has placed me in. This moment of reaching the milestone of 2 billion of God’s Word distributed across 200 nation spurs me UB to strive harder to take the Gospel to the many in my country who do not know about Jesus. Leslie – Gideon, Mumbai, India. My wife and I are proud to be members of the Gideons International! We are simply an extension of the local church. Let’s all keep praying that this ministry will continue to be used by God to share the Good News. This is a monumental moment for sure. How would you like to be the one who bought that 2 billion Bible? Who knows, you could have been the one. I like to think that all of us who gave was the very one. God caused us to want to share the powerful Word Of God and we are all winners… Isaiah 55:11 is committed to bring Godly results every time. Thank you for your sharing with me the Bible information and update. Enjoy your blessings guys, keep the blessings coming, thank goodness. God be us all to the name of Christ Jesus. Sinto-me muito feliz e agradecido a Deus por fazer parte deste Ministério a 18 anos, e ter alcançado este maravilhoso momento de alcançar o total de 2.000.000 (dois bilhões) de Novos Testamentos, distribuídos no Mundo..